Recession Economics, er Politics, uh . . . The axiom needed is “follow the money.” If we look at our stagnant economy, we tend to blame the politicians for it, but are they to blame? The two-faced Republicans claim on one hand (face?) that it is not government’s role to manage the economy, that if we just left things to the supposed “free” markets, things would take care of themselves, and on the other hand excoriating the Democrats because they are doing nothing to “create jobs.” Pundits are filling the airways with predictions that voters will “punish” the Democrats in the mid-term elections because of the poor economy. Let’s just imagine for a moment that the Republicans are correct, that the economy will take care of itself. At the same time let’s keep the axiom “to follow the money” in mind. Right now, private enterprise is sitting on somewhere between 1.5 and 2 trillion dollars of cash (estimates vary). This immense amount of money could be used to run those businesses, but apparently it isn’t needed right now. Inventories have been sold down and . . . well, what are they waiting for to hire a few more workers and expand production, even if just a little? The pundits say they aren’t acting because of uncertainty. The Republicans say they need more tax cuts. Let’s follow the money instead. There are two major incentives for business to sit on their hands right now. The first is that labor costs are going down. People desperate for jobs are willing to settle for less money to obtain one. Those with jobs are desperate to keep them, which means they are willing to take small pay cuts (unusual), produce more for the same wages (very common), or temper wage increase requests (also very common). Whenever labor is in oversupply, businesses benefit from the costs of labor going down. So, there is no rush to expand production right now for that reason. There is another reason and it is political. If they do the American thing and increase employment as a service to America (within reason, of course), there may be an actual recovery and the Democrats could hold onto Congress and the White House longer. But, if the recession drags on, a “throw the bums out” attitude on the part of voters could put the Republicans back in control, and that would be very good for business (they think). Throughout this whole scenario, the middle class is continuing to take a beating. If you look over the last fifty years, you can clearly see that the productivity of American workers has increased astronomically. (We are the most productive workers in the world, not the Germans, not the Japanese.) The wages of American workers, though, when corrected for inflation have been basically unchanged over that same period. Even the Republicans say that workers should benefit from productivity improvements (but don’t seem to be too upset when we aren’t). In 2001, income tax receipts to the government dropped significantly and then again in 2002 and 2003. Apparently, even though the economy was very, very good, people didn’t pay as much in the way of taxes. This alone threw us into a deficit situation (ignoring the two wars that were never budgeted for). Realize that the bulk of the tax savings went to rich folks and that the percentage of the savings going to the wealthy kept increasing as time went on! A study released by Citizens for Tax Justice and the Children’s Defense Fund revealed who stood to benefit from the Bush tax cuts. Among the key findings were that over the ten-year period, the richest Americans (the best-off one percent) were slated to receive tax cuts totaling almost half a trillion dollars. The $477 billion in tax breaks the Bush administration targeted to this elite group averaged $342,000 each over the decade. By 2010, when the Bush tax reductions were fully in place, an astonishing 52 percent of the total tax cuts go to the richest one percent, whose average 2010 income will be $1.5 million. Their tax-cut windfall in that year alone will average $85,000 each. Put another way, of the estimated $234 billion in tax cuts scheduled for the year 2010, $121 billion will go just 1.4 million taxpayers. 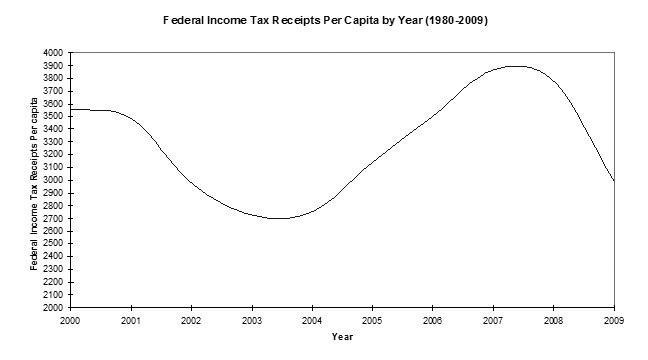 So, it is clear that the rich were getting more and more benefit from that legislation over this period, but it you take another peek at the graph you can see that tax receipts per capita went back up in 2004, 2005, 2006, and 2007. (By 2008 the recession had kicked in and income tax receipts plummeted from that.) My point is this: if the rich were getting ever increasing tax relief over this period and income tax receipts were going back up, where was the money coming from? I’ll tell you. It was coming from middle class people. The poor pay little to no income taxes and the Bush administration made sure they took care of themselves and their rich friends. Who else was there to pick up the slack? The Democrats want to keep the meager tax relief the Bush legislation provided to the middle class but repeal the tax provisions for those earning over $250,000 per year. The Republicans are dead set against this (all of whom make over $250,000 per year, of course). So, the question is: as appallingly ineffective as these politicians are, which would you rather have in power over the next few years? Only an idiot would think the Republicans are better for the middle class. But we may have to wait out businesses who are stalling the economy for their own ends. (This is what happens when we worship profit as if it were a god.) Why don’t we send them a message instead: they supposedly want stability, so let’s send a few more Democrats to Congress to make them understand that what we have right now is stable and what they are going to have in the next few years. They can afford to sit on the sidelines until the mid-term elections, but do you think they will be willing to do so for another two years after that? You Want to Pay for It? As I mentioned in my last post, the Republicans in the U.S. Senate are still blocking the extension of unemployment benefits for the long term unemployed. Part of their rationale for not voting for the $32 Billion unemployment benefits bills is that “it isn’t paid for with cuts in other spending.” This, of course, is a false premise, but let’s take them seriously. Here’s how I would pay for it and it only took me about a half an hour to come up with hundreds of billions of savings in government spending. There are billions upon billions more available with just a a little more inspection. The North Atlantic Treaty Organization (NATO) was formed after WWII as a bulwark against Russia (then the Soviet Union). In response, Russia formed the Warsaw Pact as a counterpart. NATO countries (minus the U.S.) spent $318 Billion on defense in 2008. It is very hard to figure what the U.S. contribution is because we directly and indirectly subsidize NATO in various ways. For example, we provide billions of dollars of subsidies to arms dealers who sell NATO countries arms at discount prices. I found a rough estimate of our subsidy of NATO for 1986 at $134 Billion. The European Union has 12 times the GDP and 8 times the defense spending of Russia, the only potential threat in the area. And because they know we have their backs, they can skimp even more on their own defense. Here is a list of the NATO countries and the numbers of U.S. troops we maintain on bases on their soil. Keep these numbers in mind when you think about the poor soldiers in the Middle East doing tour after tour in that combat zone. Now, regarding the countries with only a handful of our troops (5-7), I suspect that these are probably embassy guards and that is all well and good. But the other 78,000+ troops? Bring them home. They couldn’t find a number for U.S. troops in Korea; I did: 28,000. Bring ‘em home, bring them all home. We would still have over a million troops in service! Check it out! Now, let’s talk about how many nuclear submarines we need. The Republicans in the U.S. Senate are still blocking the extension of unemployment benefits for the long term unemployed. The reality, of course, is that such benefits not only help job seekers to make ends meet while they are trying to find new employment, but these monies also stimulate the economy because the folks receiving them are in no position to do other than spend those funds: on food, on rent, on utility bills. That money gets respent by its recipients creating what economists call the “multiplier effect” to the extent that each $1 paid out in unemployment benefits results in about $1.60 worth of economic activity. This is not just Republicans playing politics (although they are). There are a couple of issues underlying their current actions. One is a longstanding aversion to poorer folks. They have recently called the long term unemployed “lazy” and being willing to live off of “government handouts.” As if $1400 per month is a ticket to “fat city.” Republicans can’t not believe that everyone should be like them. Why, it was just hard work and diligence that got them to where they are. They are self-made men/women, by God! Yeah, right. If you aren’t successful like them, then you must have personality failings (being lazy, shiftless, unfocused, undedicated, etc.) accounting for your lack of success. In their world there is no such things such as bad luck, prejudice, or extenuating circumstances. In their minds, government handouts breed dependency. Part of their rationale for not voting for the $32 Billion unemployment benefits bills is that “it isn’t paid for with cuts in other spending,” that is the Republicans are posing themselves as being fiscally responsible. Of course, this didn’t prevent them for voting wildly for a $33 Billion bill, also not paid for, to support the war effort in Afghanistan. Both of these poses are far from the truth. The Republicans are self declared “free market” advocates. They claim to believe that the markets can take care of all of the problems that we face economically. The private sector will hire all of the unemployed, we just need to give it some time, etc., etc. In actuality, the republicans do not believe this for one minute. They have been in the forefront of congressional action for over a century of providing corporate welfare, that’s right, “government handouts” in the form of direct and indirect support. One such form of corporate welfare is tax relief, for example. One of the biggest beneficiaries of tax relief are the oil companies. The five most profitable companies in the world are oil companies, but we are still waiving much of the taxes they would pay, like any other business. (If you don’t believe me, go to Wikipedia and look up the “oil depletion allowance.” We require oil companies to pay for leases to drill and pump oil on Federal land, but eventually all the oil in a deposit will be gone and all the poor oil companies investment in equipment, etc. will no longer be making them an income, so big tax breaks are needed! The fact that other businesses are expected to pay their own “costs of doing business” and the prices of leases are set according to how much profit an oil company thinks it can make, and they are making really huge profits(!) indicates that this support is unnecessary. There are consequences to corporate welfare, too. The federal government is subsidizing the cost of oil/gas and consequently the price you pay at the pump is actually much higher (maybe twice as high) but you have already paid half of that price in taxes! Consequently, you think gas is cheap and will drive more accordingly, which leads to more climate change, highway congestion, etc. which cost you even more. At the same time Republicans are preaching “fiscal responsibility” they are promoting and supporting massive amounts of corporate welfare. If they really believed in “free markets” they should have a “sink or swim” attitude toward all business interests in protective legislation . . . and they don’t. Free market advocates should be on the side of the consumers, not the producers (businesses) said Smith. Republicans are not, nor have they been for a very long time.